Special Containment Procedures: SCP-3565 is to be kept in a storage room at Site-51. If anyone working at Site-51 displays symptoms of SCP-3565’s perception-altering effects, they are to be transferred offsite and amnesticized immediately. Once per day, personnel assigned to SCP-3565 are to insert a ½ liter bottle of human milk into SCP-3565 and are not to leave until the bottle is empty. Following Incident 3565-A (See Addendum), Site-51 staff assigned to SCP-3565 are to be cycled every third week. Revisions to containment procedures for SCP-3565-1 are pending. Description: SCP-3565 is 3kg mass of ground porcine, bovine, and human flesh. Approximately 10% of adult humans perceive SCP-3565 to be a human infant of variable appearance, though affected individuals who are themselves parents will often describe SCP-3565 as looking similar to their own children. Individuals affected by SCP-3565 feel an extreme compulsion to feed and care for SCP-3565 and will become distressed if they are refused contact with it. Testing has shown that SCP-3565 is not alive. Despite this, SCP-3565 is capable of metabolizing human milk, and doing so delays the putrefaction process and gives SCP-3565 limited regenerative properties. SCP-3565 requires approximately half a liter of milk a day to maintain these properties. If SCP-3565 is given milk in excess of this amount, it will slowly grow in size proportionate to the amount it was fed, though it will revert to its original size over time if feeding portions are brought back down. 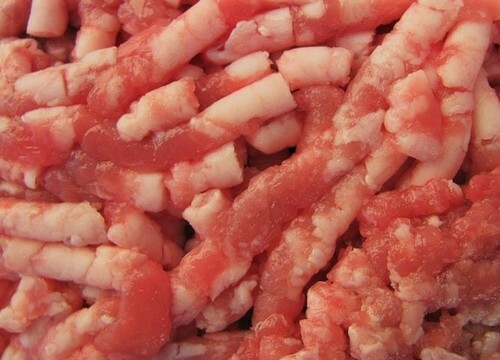 If SCP-3565 is not fed or is fed less than half a liter of milk a day, it will begin to rot like nonanomalous ground meat. Additionally, individuals working near or with SCP-3565 when it is unfed have reported hearing a baby crying, with the frequency and intensity of the crying increasing the longer SCP-3565 goes without feeding. The number of individuals who perceive SCP-3565 as an infant has also been shown to increase over this period. On 02/05/20██, Dr. Javier Martinez, then the head researcher for SCP-3565, was rushed to the infirmary after falling unconscious following complaints of abdominal pain and nausea. An examination of Dr. Martinez revealed that he had grown a functional uterus and birth canal. Additionally, ultrasounds of the organs showed what appeared to a human fetus at four months of development. Dr. Martinez was given an emergency cesarean section, and a 1kg mass of ground meat, now designated SCP-3565-1, was removed from his abdomen. The mass’s composition and anomalous properties are identical to SCP-3565. Following the incident, all staff at Site-51 were given a thorough medical examination. 75% of staff who had been working in close proximity to SCP-3565 for more than 3 weeks displayed physical abnormalities similar to Dr. Martinez’s, though none were more than a week into the gestation period. All individuals were given Mifepristone and administered amnestics. Affected males had extraneous organs removed.